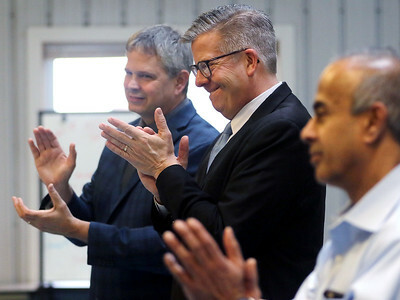 Congressman Randy Hultgren (center) applauds employees and clients with Co-CEOs Sam Tenuto (back) and Frank Samuel (front) during a visit at the Pioneer Center for Human Services on Tuesday, March 27, 2018 in McHenry. 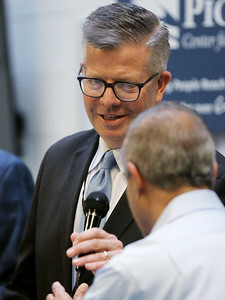 Hultgren presented the facility with the proclamation he made on the house floor in honor of the agency's 60th anniversary. 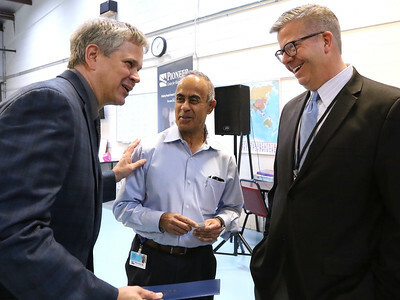 Congressman Randy Hultgren (right) talks with Co-CEOs Sam Tenuto (left) and Frank Samuel (center) at the Pioneer Center for Human Services on Tuesday, March 27, 2018 in McHenry. Hultgren presented the facility with the proclamation he made on the house floor in honor of the agency's 60th anniversary. 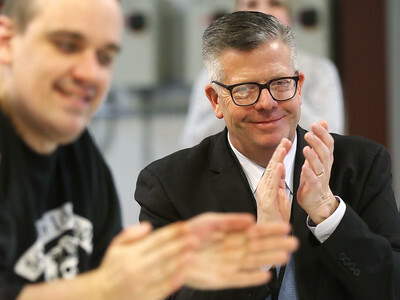 Congressman Randy Hultgren applauds clients at the Pioneer Center for Human Services on Tuesday, March 27, 2018 in McHenry. Hultgren presented the facility with the proclamation he made on the house floor in honor of the agency's 60th anniversary. 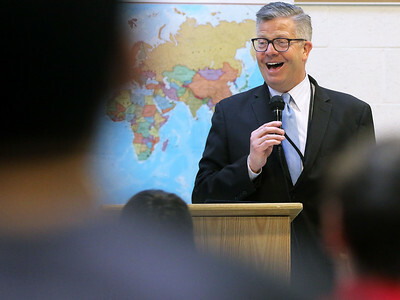 Congressman Randy Hultgren speaks to employees and clients at the Pioneer Center for Human Services on Tuesday, March 27, 2018 in McHenry. Hultgren presented the facility with the proclamation he made on the house floor in honor of the agency's 60th anniversary. 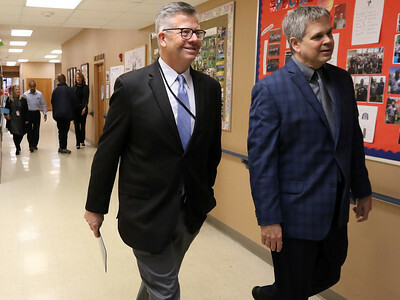 Congressman Randy Hultgren arrives with Co-CEO Sam Tenuto at the Pioneer Center for Human Services on Tuesday, March 27, 2018 in McHenry. Hultgren presented the facility with the proclamation he made on the house floor in honor of the agency's 60th anniversary. 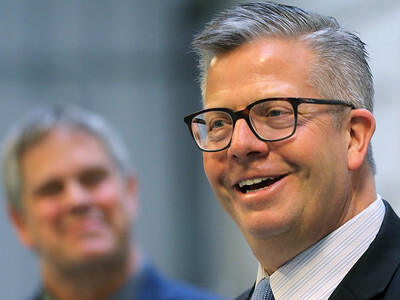 Congressman Randy Hultgren applauds employees and clients after leaving the podium during a visit at the Pioneer Center for Human Services on Tuesday, March 27, 2018 in McHenry. Hultgren presented the facility with the proclamation he made on the house floor in honor of the agency's 60th anniversary. 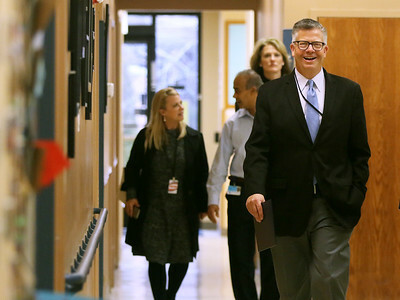 Congressman Randy Hultgren arrives for a visit with employees and clients at the Pioneer Center for Human Services on Tuesday, March 27, 2018 in McHenry. Hultgren presented the facility with the proclamation he made on the house floor in honor of the agency's 60th anniversary. 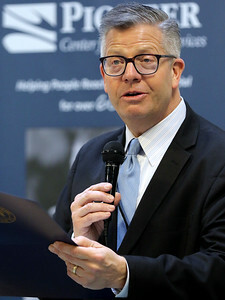 Congressman Randy Hultgren reads from his proclamation at the Pioneer Center for Human Services on Tuesday, March 27, 2018 in McHenry. Hultgren presented the facility with the proclamation he made on the house floor in honor of the agency's 60th anniversary. 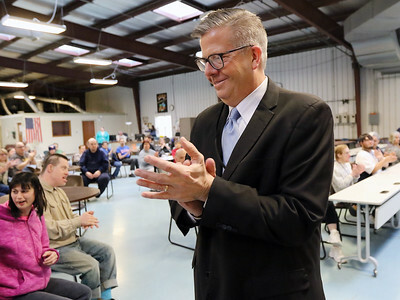 Congressman Randy Hultgren speaks with employees and clients at the Pioneer Center for Human Services on Tuesday, March 27, 2018 in McHenry. Hultgren presented the facility with the proclamation he made on the house floor in honor of the agency's 60th anniversary. Congressman Randy Hultgren takes the microphone from Co-CEO Frank Samuel during a visit with employees and clients at the Pioneer Center for Human Services on Tuesday, March 27, 2018 in McHenry. Hultgren presented the facility with the proclamation he made on the house floor in honor of the agency's 60th anniversary. Congressman Randy Hultgren shows employees and clients his proclamation during a visit at the Pioneer Center for Human Services on Tuesday, March 27, 2018 in McHenry. 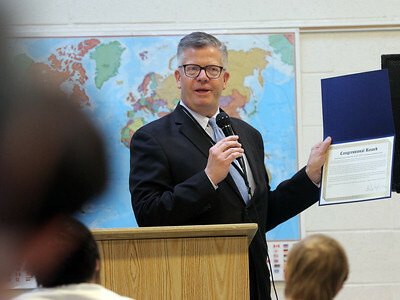 Hultgren presented the facility with the proclamation he made on the house floor in honor of the agency's 60th anniversary.